CHAUVET®, a leading manufacturer of LED lighting, announces the newest addition to the Intimidator™ family of scanners and moving yokes: Intimidator™ Barrel LED 300 . This feature-packed barrel-style scanner joins the Intimidator™ family with impressive, saturated effects and a sleek, lightweight housing. 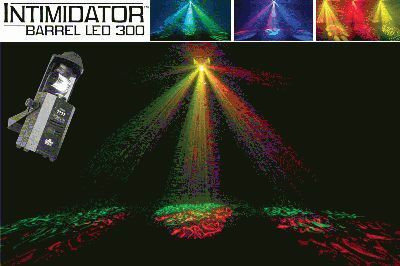 Powered by a flicker-free 60-watt LED, Intimidator™ Barrel LED 300 is a bright, compact scanner that fills dance floors with effects and adds energy to any event. This fixture is perfect for bar and club installations, on-camera events, mobile performers and many other applications in need of crisp, high-speed effects. A three-sided prism multiplies the beam as the spinning mirror barrel projects the effect covering larger areas. To increase design flexibility, the scanner includes seven (five metal and two glass) interchangeable, rotating gobos and eight split colors on independent wheels. Additional features include built-in movement macros and move-in black capability, electronic dimming and strobe, slot-n-lock gobos and a motorized focus while individual reset of pan and tilt, color, gobo and focus allow for a continuous show. Intimidator™ Barrel LED 300 allows you to build custom light shows using either basic eight-channel or advanced 11-channel DMX mode. For simple plug-and-play operation, built-in automated programs generate synchronized shows in master/slave mode while sound-activated programs dance to the beat of the music. 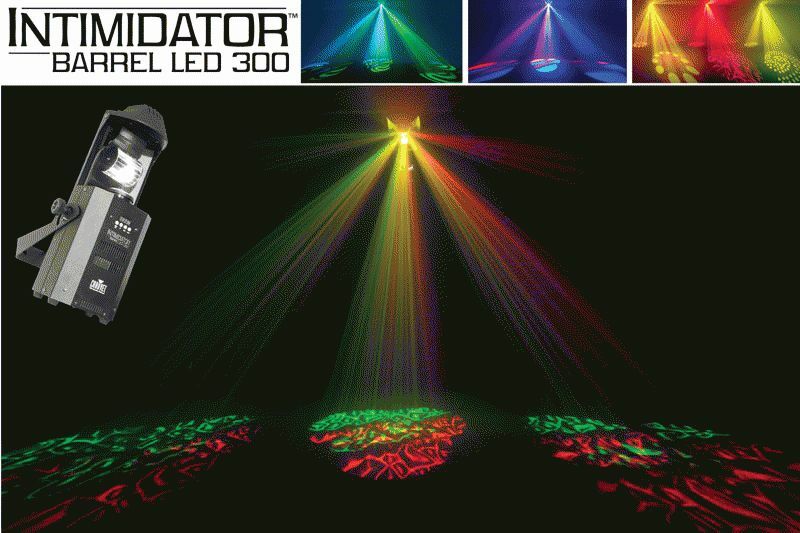 This fixture works in master/slave mode with Intimidator™ Scan LED 300 for increased effects and power linking saves time running cables and extension cords.